Slow Cooker Creamy White Chicken Chili is a comforting, flavorful soup that you will want to warm up with every night. The combination of chicken, green chiles, and beans with cream cheese and heavy cream makes for a variety of textures with just the right amount of spice. Plus it’s all made in the slow cooker, so it’s the easiest recipe ever! Chicken Satay Stir Fry - all the flavors of your traditional chicken satay served on skewers, but in a stir fry form over rice as a quick and easy dinner! Heck yeah. Instant Pot Jambalaya is a comforting meal that can be made in under an hour and feeds an army of people. 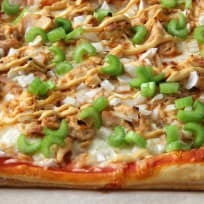 Get your spicy on! Easy Chicken Fajitas - skip going out and make chicken fajitas at home! 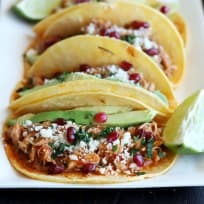 Super easy to make any night of the week, take your taco night to a whole new level! 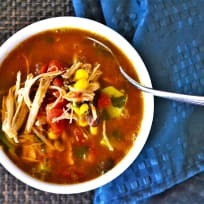 This Instant Pot chicken taco soup is so fast and easy to make and everyone loves it! It's one of our favourite meals - just throw everything in the Instant Pot, hit start, and dinner is ready in half an hour! 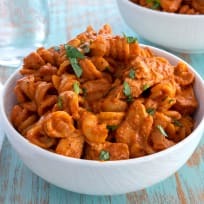 Make my easy recipe for Instant Pot Chicken Florentine Pasta. This one pot meal is packed with protein and veggies and done in less than 30 minutes.